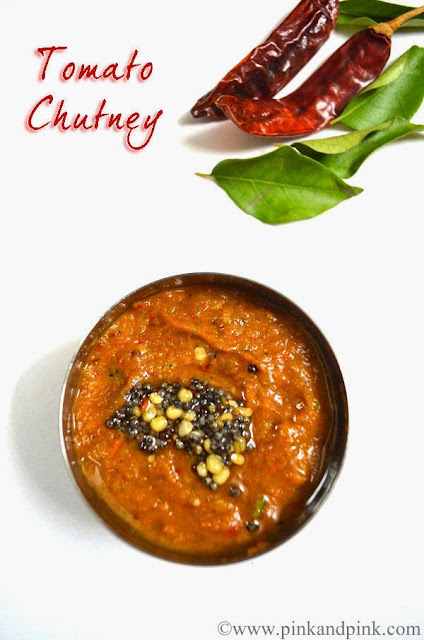 Tomato Chutney recipe is one of the easy chutney recipes which have dominating tomato flavor. 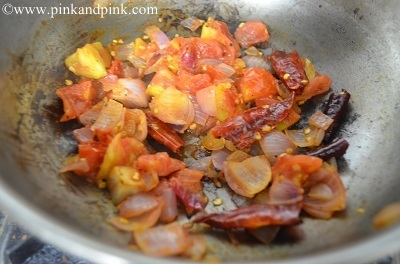 I have already posted another version of onion tomato chutney without coconut in this blog. 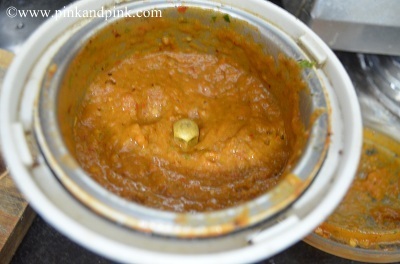 Also, I have posted how to make onion tomato chutney with coconut. This is another version of tomato chutney. There are endless options to make chutneys and this tomato chutney is one of the easy chutney recipes. This thakkali chutney(in Tamil) is very famous in Tamil Nadu. You can check many more chutney recipes here - Chutney recipes. 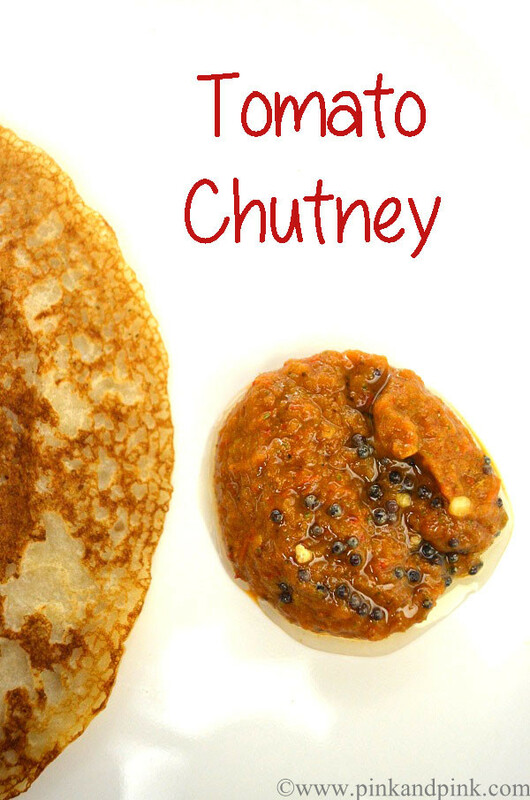 I have posted chutney recipes that can be made with coconut and without coconut too. This tomato chutney recipe is prepared without coconut. So, people who are in restricted diet can opt for this tomato chutney recipe. I have few more recipes for the same tomato chutney. I will definitely post them soon here. 1. Heat a tsp of oil in a pan. 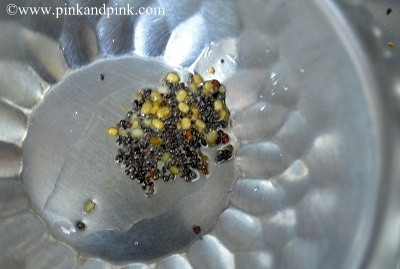 Add 1 tsp mustard seeds and let it splutter. Add 1/2 urad dal, a pinch of hing and few curry leaves. Saute till the urad dal turns golden brown. Keep it aside. 2. Heat 1 tsp of oil in the same pan. Add chopped onions and saute till they turn translucent. Add 2-4 red chillies, 2 chopped tomatoes and salt till the tomatoes turn mushy. Switch off the stove. Allow it to cool down. 3. Grind the tomato and onion mixture along with a peanut size tamarind, salt and requires water for grinding. Grind it to a chutney consistency. Transfer the tomato chutney to a serving bowl. 4. Add the tempered items to the tomato chutney. Mix well and serve. 1. Tomato chutney tastes best with Sesame oil/Gingelly oil. 2. If you are preparing this tomato chutney for kids, add only 2 red chillies. For medium spicy level add 3 red chillies. For more spicy tomato chutney, add 4 or more red chillies. Enjoy tomato chutney with hot idli and dosa. Signing off today. Will meet you with another interesting post.